First chop the liver pieces into very small cubes. Otherwise they will be too clunky to squeeze into the shingara. The liver cubes then need to be marinated with 1 tsp red chili powder and 1 tsp turmeric powder for an hour. After an hour, boil water and salt in a pot. Then throw the marinated liver pieces into this boiling water. After it starts to boil vigorously, then drain the water immediately. There is a distinct smell to liver most of the time, and this process gets rid of that smell. This is after water has been drained. Now heat oil in a pan, and toss in the ginger and garlic in the oil. Right after the ginger/garlic, toss all the dry spices in the oil and pour 1/3 cup of water to cook the spices. Cover and cook until the oil separates. Now toss in the liver and mix it in with the spices. Saute for 5 mins. Now pour about a cup of water into the pan and cover and cook. Don't forget the salt. Once the water dries up, and the liver is cooked through, toss in the sliced onions and chilis. Saute until the onions are soft and translucent. Time to make the dough. Mix everything together first before you pour water. Pour water little by little, until you get the right consistency. 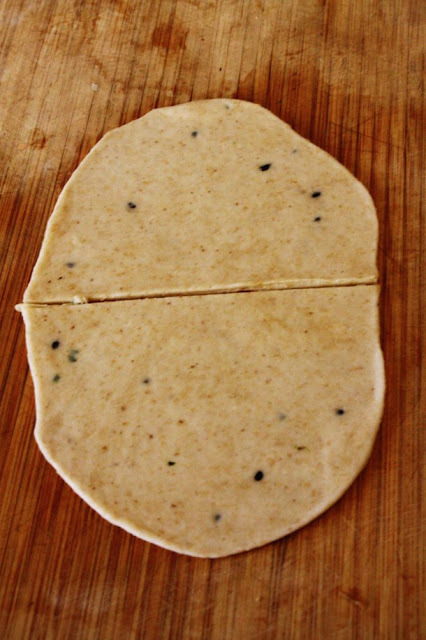 Roll out each part into an oval. And cut it in half. 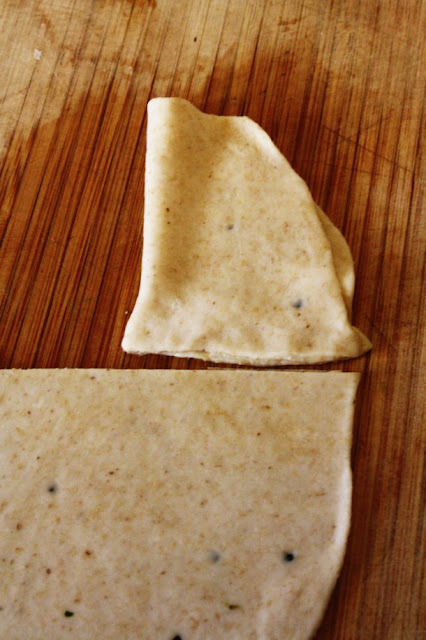 Now fold the straight side and pinch to close it. 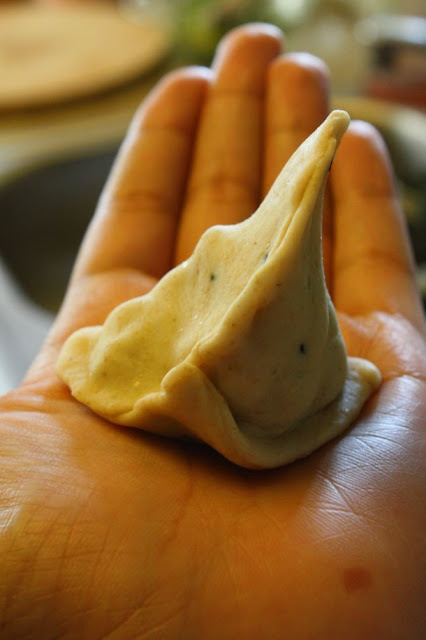 Making a fist with your hand place the dough inside like a flower. The closed off corner is sitting in the inside of our hands while the open sides are splayed over outside. 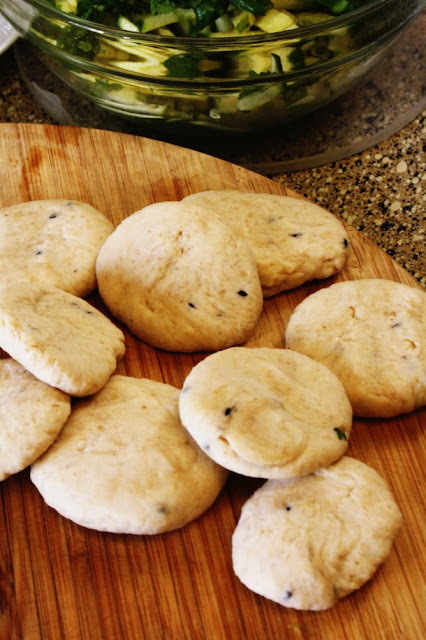 Once you have placed the liver inside the dough, fold over the open sides and pinch them close. This side will be flat so it can stand upright. Just like in this image. Repeat above steps for the rest of them. You can either deep fry or bake the shingaras before eating. I shallow fried mine. Eat with any sauce of your choice. We ate ours with spicy tamarind sauce.